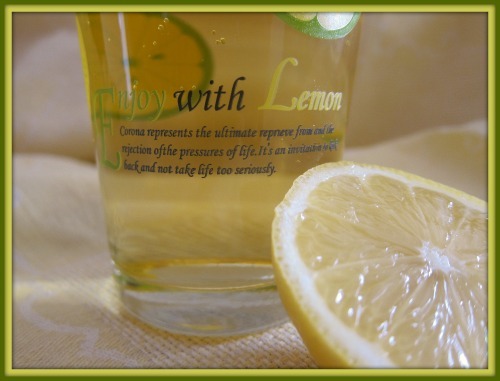 Life-lemons and lemonade-lessons | The difference is in the detail. One year ago, a life so perfect started to take a few bumps and beatings. A lot of loss,hurt, panic, sadness, anxiety , anger and stress made its way into the Queen’s castle! And when my mom passed away in November, I took only a few items from her house. The most precious one of them all…this little sign…. It is such a cliche, right?! 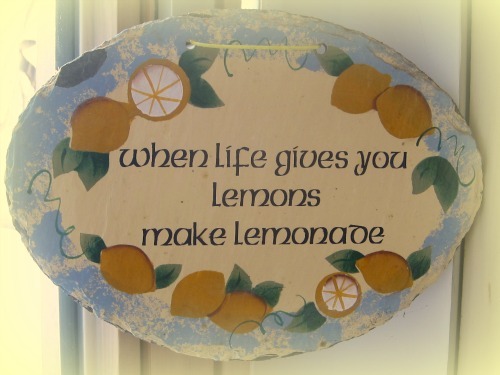 But, what is the recipe for making the lemonade in real life? Today, I am sharing my recipe for coping with all of this. I have to admit that I am not yet at the stage of adding the sugar and chilling it…but I am slowly making my way there.. 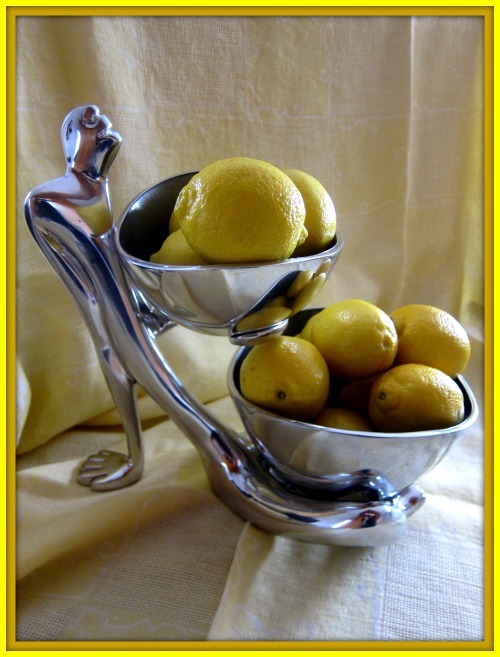 So, to reflect on what I do with my lemons……. 2. THEN… STOP for a while and forget about the rest of your life….sometimes when the juice squirts in your eyes you have no choice but to take a moment and gather yourself together…do not feel guilty that you have missed out and dropped the ball in a few other areas while you were busy dealing with the crisis…let it be the most important thing in your life for a day or three…. I am sure the school forgave me for not signing up to come see the teachers for parent conference day and I am not going to feel like the worst mother ever… I just went back, said sorry and will see them tomorrow….I simply can not have my mind everywhere it needed to be…. 3. Think about things that came as a result of this….ponder some thoughts on side -effects this created (not neccessarily good things that came out of it – because that is very hard to see in a time when there is really no good thing in it for you…??! ), but for eg. be reminded of how wonderful your support network is, who your true friends are, who you can trust in situations like this, how making you stop made you realize some things that has nothing to do with this…. for example…when a bad thing happened to my nanny, I got to do a few things with my little one that I have not done in a while and I really enjoyed dressing her and giving her breakfast whilst I dont always get to do that anymore because there is someone helping her with that….I am still not happy that this happened but it made me think again of other things that came as the ripple effect…..
4. Do NOT ask WHY this has happened. This is counter productive and makes you go back and forth as if on a swing… you do not get anywhere because we as humans are simply not equipped to anwer that question. For death, illnesses and tragedies we do not know and will not know. It is exhausting to do that. 5. Return to your Source of inner strength and calm…. the place or Person that can help you pull through a tough time….. If you are a believer, let go and let GOD. If not, find your source of comfort and go there for inner strength. Sometimes it is too difficult to pray during your own suffering. Ask others to do that for you…or just be still and He will know about it anyway…ask for Peace and you will receive it. You might not get the answer or a solution, but you will find peace in accepting your circumstance. And if you are not strong enough to pray, be quiet and put on some beautiful music…and don’t panic. Your stamina will return. 6. Get back to basics in taking care of yourself….eat well, go to bed early, drink a lot of water, get some exercise…….getting overtired and stuffing yourself with junk makes you feel even more miserable and does not help the situation at all… I am very guilty there…. I tend to stay up and do comfort-eating, give up on exercising and soon enough I have even more things to be depressed about ! 7. Get dressed and dolly yourself up a bit ! Take a good look at yourself. Again – GUILTY. I find something sloppy to wear and hang around the house. It feels like everything, including me is a mess ….. Do not get me wrong…. I LOVE hanging out around the house without being all dressed up – I can stay the whole day in pj’s …but, what I am saying is that in a time of crisis, it is not the right time to do that…do that when you are on top of the world, feel like you can achieve anything and in control of your life and emotions…otherwise…. get up and get dressed…so you can face your sad face in the mirror !! 8. Find a creative outlet...yes, like blogging…or baking…or whatever it is that you love to do and that gives you energy….In times of crisis, we often don’t allow ourselves to do the things we love because we are absorbed in the thick of things…but force yourself to spend just a little time on your hobby or something that gives you joy..something that will inspire you from within yourself….that will take your mind off things even just for a moment….that will force you to make an attempt to light the fire that life just blew out…so you will feel that you still have the ability to give even though it feels as if all has been taken from you…. 10. 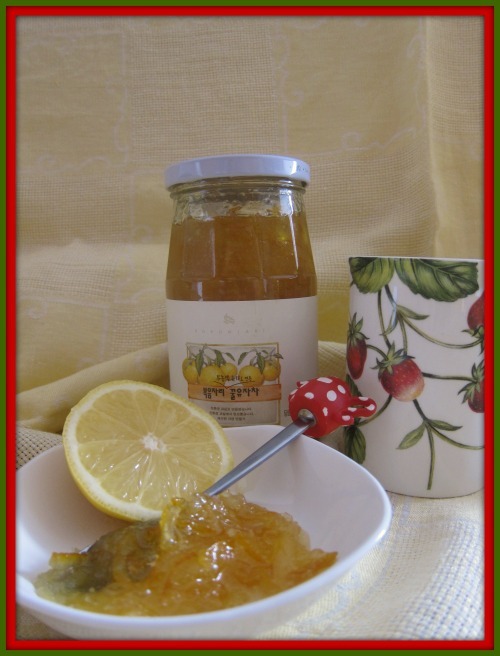 And then – go DO something – go DO something with your lemons….be pro-active, come up with plans to make things better, take action and move on from your place of sadness and insecurity and sickness….if you have nothing else to do……go make some real lemonade !! For the recipe – see the bottom of this post. 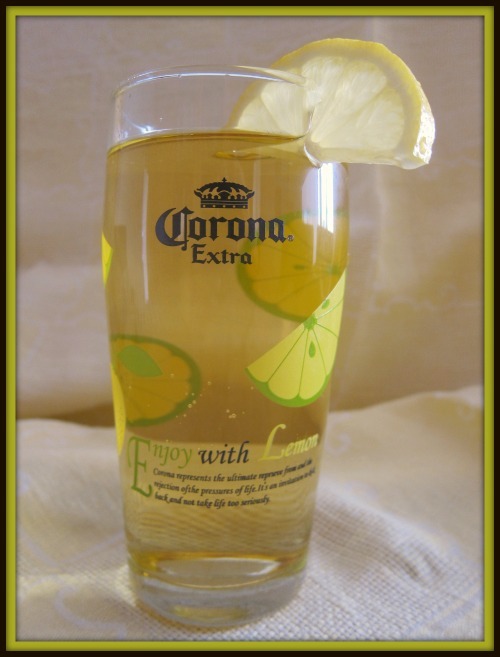 If it is cold and you don’t feel like a refreshing glass of lemonade..how about some lemon tea. 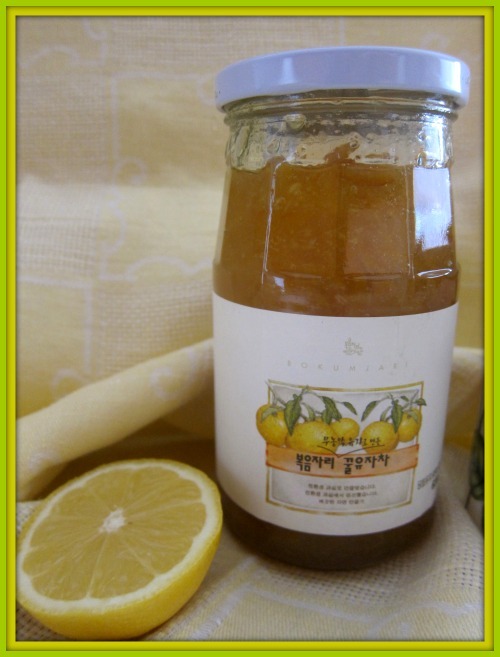 In Korea, you get this lemon preserve. I love it. You spoon it into your cup…and just add hot water… It is delicious and heart-warming and is a good alternative for hot chocolate or coffee….. But, in the process of looking for it, I found this glass in the cupboard…. So it need not be lemonade. There are other things to do with the lemons you got in your life. Everyone’s situation is different and everyone responds differently. The important thing is to make something with YOUR lemons. 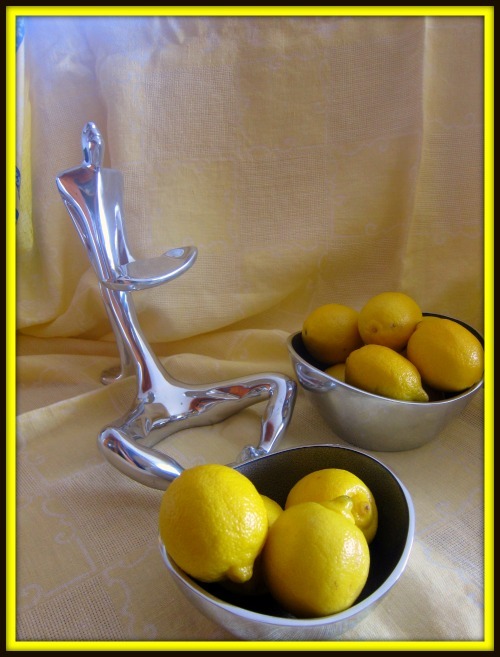 But for those of you who really read this blog for inspiration on design and decor, I did after all find something to share with you when I went to get the lemons. 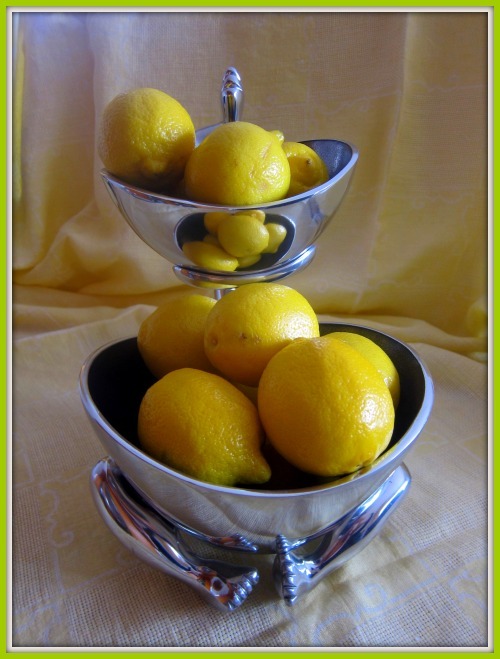 It is the fruit bowl that I bought on my recent trip to South Africa. It is from the South African designer Carrol Boyes. She has AMAZING things !!!!! and I am a true admirer of her work. It consists of two bowls, a small and medium, size which you can easily pass around the table if you want to hand out the fruit. It is not neccessarily for fruit but anything you can think of, of course ! If you do go to South Africa, be sure to look for her work. Just ask around and anyone will direct you to an outlet in selected malls. You can find it in selected international stores and now also online. She constantly comes out with new designs and they are a feast for the eye ! Remember – Carrol Boyes. If you go to the site, there is also a competition going at the moment for new designers. So, if you happen to be one or aspire to be one – go see the METAL MESS AROUND competition at her site. There are great prizes to win and a promising career for the lucky winner! Right now…. I so wish that I could blog more about design, decor and detail as this was the intention of my blog….but reality is that life has thrown us these lemons …and they have been coming at a bit of a steady pace over the last few months…. So, here is to you, Sam…for inspiring me to write a blog post despite dealing with little one’s diarrhea, dialysis and other dilemmas in life right now ! 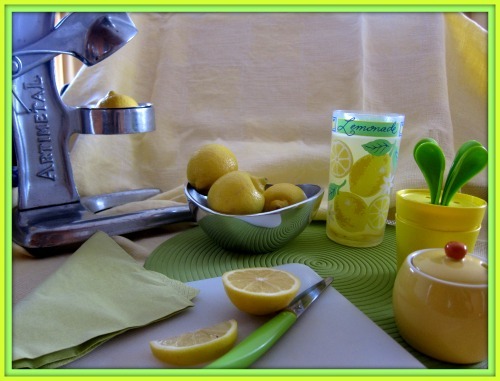 If you have a few ingredients for lemonade, do not be shy to share them in the comment section below! 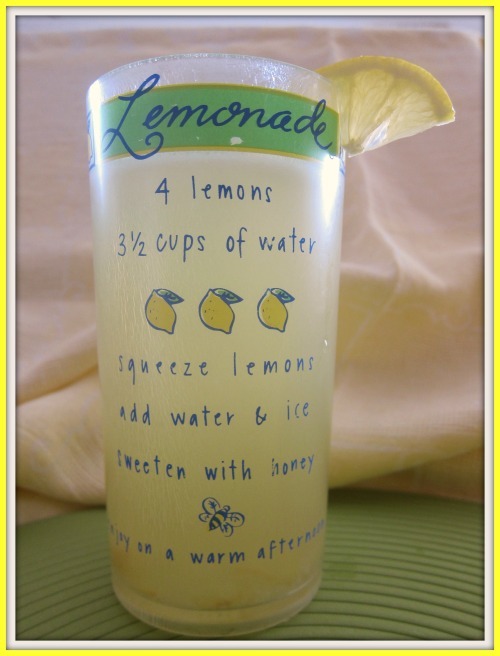 If you want to know how my lemonade is tasting so far…go follow me on Twitter (idodetail or click on the blog’s sidebar), as I will be posting my progress on steps 1-10 in the coming days. And if all else fail – go grab the Tequila and Salt… I have no further advice for you !! allergic to fruit?! wow. That’s big! Well I am allergic to fresh fruit. So I can have juice from concentrate and canned stuff and the like.